Producing these intricate mosaics required a lot of work — negotiating with Home Savings about the location and design; creating a sketch; transforming the sketch into a full-color gouache; making a slide, to project on the wall to form a full-scale cartoon; tracing that cartoon in reverse, marking the colors, and then transferring it to the floor, where the tesserae could be cut and pasted in sections, only to be assembled on site into a right-side-up, all-mortared-together mosaic. Needless to say, if one individual tried to do all that work alone–and then add architectural elements, stained-glass windows, decorative insignia on the doors and windows and cornice–it would take years, if not decades, to complete. Some of that assistance might be seen as incidental to the artwork–I am no mason, but laying the mortar seems more workmanlike to me, for example–but others involved in the translation of idea into realized artwork clearly had to be artists in their own right. While Millard Sheets was the face of the studio and the source of many of the designs, his closest collaborators were Denis O’Connor and Susan Hertel. Hertel was a painter in her own right, who worked in the studio creating the large-scale cartoons and doing most of the color selection; those I have talked to say her human figures are distinctive for their flowing lines. 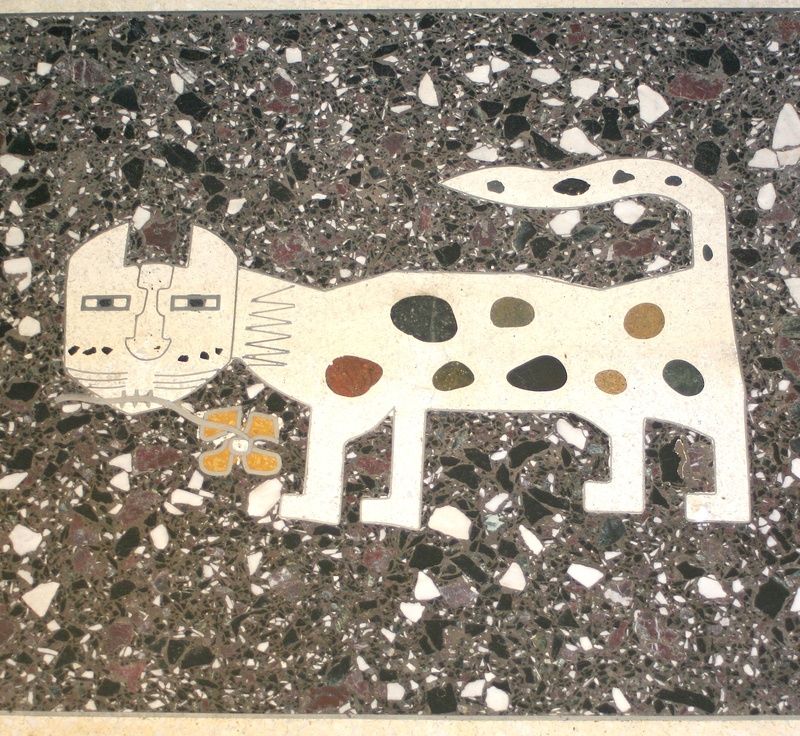 O’Connor, who had trained in the Royal Academy of Arts as a sculptor but had won drawing awards there, came to Claremont in 1960 and began work on the mosaics. And O’Connor and Hertel continued to work together on projects for Home Savings after Millard Sheets closed out his interest in the studio, in 1980. Thus, when we look at the Home Savings art and projects like them, we have to keep in mind there is a vast team, including many artists, working together, and that the final signature — in this case, those of Hertel and O’Connor, indicating they may have conceived the design from start to finish — only reflects one or two of those involved with the work. This week I had a chance to sit down with Denis O’Connor’s son, to hold some of the tesserae from the mosaics in my hand, to discuss the specific processes of making the tiles level and the design realistic. 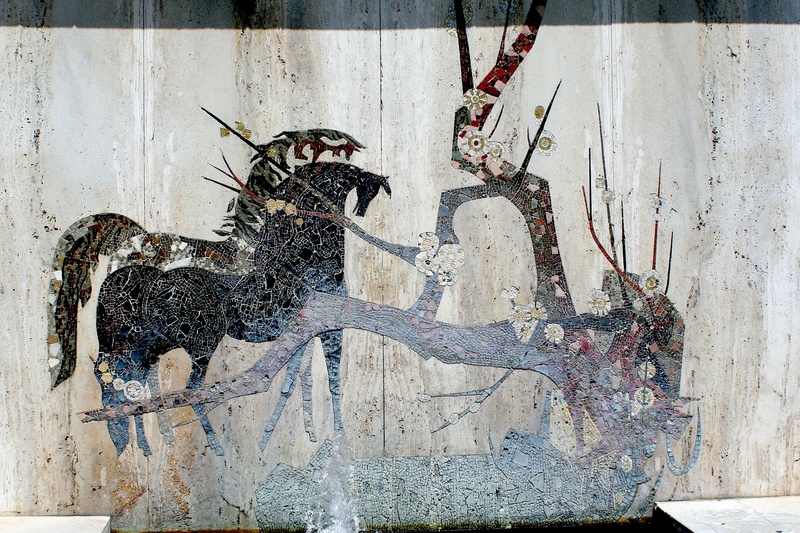 He has a great painting by Susan Hertel, showing the process of mosaic making — the work of men and women sitting around on the floor, surrounded by numbered cans filled with tiny pieces of glass, snippers in hand and the wheat paste nearby. 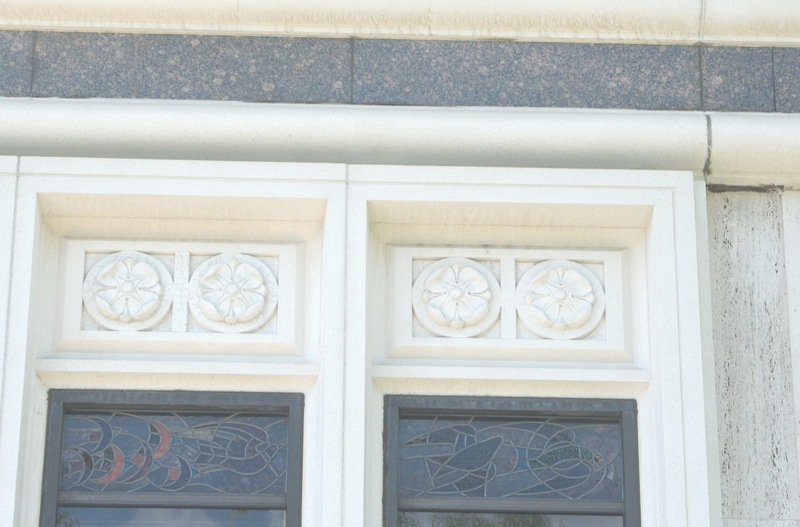 I hope to speak to more of the mosaicists soon, but clearly a lot of drudgery came between conceiving of the design and seeing the final product, gloriously installed. 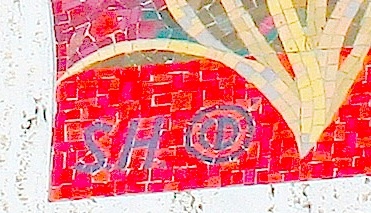 O'Connor and Hertel, Tujunga mosaic, full image. In terms of the artistry here in Tujunga, there are some interesting signs of the collaboration: the flowing plants and maternal figures, present in many of Hertel’s works, sit within the overall outline of a tree, a later and more sophisticated choice of design than the early, square mosaics. 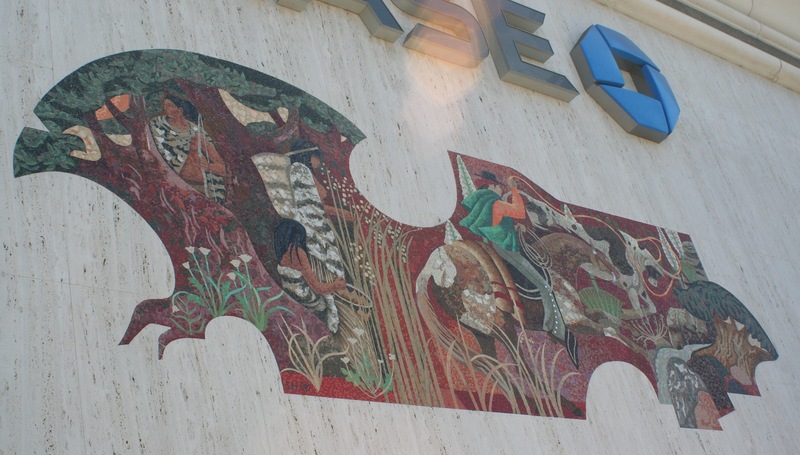 Millard Sheets collected Native American art, especially from the pre-Columbian period, and this work shows echoes of a large painting, signed by Sheets, in the Pomona First Federal building in Claremont, showing American Indian men gathering horses, and American Indian women, some bare-breasted, sitting in a circle. Here, a Native American man holds a bow, while a Native America woman sits with a basket — perhaps reflecting the lifestyle of the Tongva, who gave the area its name. To the right, a vaquero roping a bull reflects the later Californio period. Do the stalks between them reflect wheat or bullrushes, agriculture or river foliage? Do most of the figures face right, to show the passage of time in that direction, or do they not engage one another to show a hostility, a pain between these communities? As I work with the preliminary sketches and correspondence about these images, I hope to find some answers. Here’s the latest from a friend of the blog, Vickey Kalambakal, on Sheets’s work, and celebrating four of the works around the state: “Saving the Art of Home Savings,” for the September 2010 issue of Westways. She discusses the partnership between Ahmanson and Sheets that created the string of banks bearing many of the iconic images, and the relationship between the Pomona bank tower and the pedestrian mall just discussed in the Image of the Week last Friday. Brevity meant Vickey kept narrowly to these four images, with a concise description of how the banks and their art came to be, and how Tony Sheets, Millard’s son, sees the changing patterns of banking and bank security affecting the art’s display. But there is a great sense of those connections between art and place, history and community, on display there. Vickey mentions the brochures that were available at the Hollywood bank, to identify and describe the artwork; it was titled “From Oranges to Oscars,” and I have recently seen a copy. I’ll be posting about it in the weeks ahead. When I started looking into the Millard Sheets Studio, I thought they primarily decorated buildings and spaces designed by others. What I have learned, however, is how important architectural designs were to the studio’s work. Sheets oversaw the architects who designed most of the banks where his studio’s mosaics, murals, and paintings appear, but he also oversaw the creation of other innovative urban spaces, built around community. This fountain demonstrates the marriage of Millard Sheets’ favorite themes — horses, nature — with this urbanist, community-driven desire. Nothing specific in the image speaks of history, but its location speaks to the importance of the Pomona community to Sheets, and the elements speak of friendship — two horses, not one; flowering branches of spring, not a lonely winter landscape. In terms of preservation, this mosaic shows some of the ravages of being outside, with the calcinated California hard water constantly running; the pedestrian mall section was reopened to cars, and now the fountain sits a bit isolated. But the history the mall represents is still a powerful sign of the Sheets studio’s urban vision, one rooted in the history of California as they understood it. I have lived in Los Angeles for a month now, and I have the chance to encounter the work of the Millard Sheets Studio constantly — when sought out in Pasadena, at the offramp to the Westminster Mall, all around the Claremont area. I have had the occasion to discuss my interest in the mosaics, murals, and sculptures with those who knew Sheets, with the children of those who worked in the studio, with (thankfully understanding) bank managers, and with librarians, curators, archivists, and historical preservation activists, whether professional or amateur. I’m learning a lot about the process by which the art was conceived, designed, and created by Millard Sheets, Sue Hertel, and Denis O’Connor, and I am thinking more deeply about their influences and goals, and how it relates to my original desire — to learn how banks designed and decorated after World War II came to reflect the earliest histories of California, as well as the region’s glorious flora, fauna, and diversions. I am working on a new database, using lists from the Huntington Library and the Smithsonian’s Archives of American Art, to create a complete list of the Sheets Studio’s creations, the designer and date — as well as their current status as safe, lost, or threatened. To start rolling out those ideas, and to keep the slew of other professional work (like my just-finished book) from sidelining this investigation, today I inaugurate a new series on the blog: Millard Sheets Studio Image of the Week! I’ll pull an image from my travels, or my extensive archive of Sheets-and-co. images, and give you a sense of what I think we’re seeing. I visited the office yesterday with Brian Worley, a Friend of the Blog and a onetime worker in Sheets’s studio, helping with everything from background work on the mosaics to installation and documentation of the work once completed. The visit will provide a lot of images and information, but today I’ll relate how this cat came to mind as the perfect image of what I now know about Sheets — curious, creative, and seeking to infuse his designs with joy and fun. The work of the Sheets Studio has a lot of animals, a lot of families in loving embraces, or out having fun, and the artwork of the studio complex (more in coming weeks) reflects this interest. Brian told me there used to be a birdcage right in the center of the two buildings, their color, activity, and song presumably filling the space between Sheets’s office and the large production studio, the shelves stacked with cans of mosaic tesserae. So Sheets’s clients would see the exterior decorations, hear the birds, and then come inside to await their appointment — and see this wonderful cat, embracing the moment with a flower in its mouth. We can feel welcomed to explore the Sheets Studio work, too.